With my husband, Neil Wilson, and my dog, Devon. 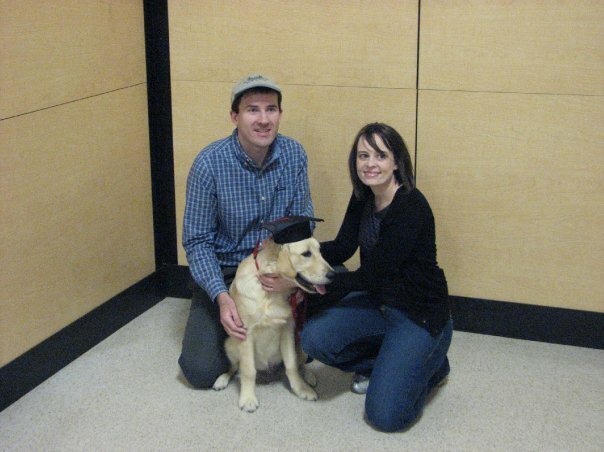 He was a puppy at the time and graduating from training classes. Hello and welcome! I am so excited to be a part of the NOAA Teacher at Sea experience. I currently teach chemistry, engineering, and technology at Lanier High School in Sugar Hill, GA (outside of Atlanta). I am part of an awesome project based learning (PBL) program called CDAT (Center for Design and Technology), which focuses on science, technology, engineering, and math (STEM). Lanier High School opened in 2010, so this is our fifth year as a school; however, this is my first year teaching here. Before transferring to Lanier High School, I taught sixth grade Earth science at Lanier Middle School for eight years. Now, I have the awesome privilege of teaching many of my students a second time. It’s really fun to see how much they have grown up and matured since they were sixth graders. I am looking forward to sharing what I learn with my students as I think my engineering students will gain insight into shipboard careers they may have never considered, especially as it relates to engineering. I think my technology students will get a chance to see how scientists collect and organize data using technology tools. Although I teach chemistry and this research cruise is focusing on fisheries, I know my students will gain a new understanding of our oceans. Sampling the health, age, and quantity of different fish species with the NOAA scientists help us to measure the health of the oceans. Some of the big issues with the health of our oceans concern overfishing, human pollution, and ocean acidification. Ocean acidification refers to how the oceans take some of the extra carbon dioxide from the air and dissolve it into the water. This lowers the pH of the water making it more acidic, which can affect the health of the ocean’s inhabitants. I applied to be a NOAA Teacher at Sea so I could learn more about our oceans in order to share this knowledge with my students. I have always been a hugely passionate about space and space exploration. I’ve had so many cool space opportunities like seeing shuttles and rocket launches, going to Space Camp, floating in microgravity, and most recently, helping our students talk to Reid Wiseman on the International Space Station via amateur radio. Space is awesome and amazing, but we have an equally amazing frontier right here on own planet, our oceans. I want to be able to share with my students about the oceans with as much confidence and enthusiasm as I do about space, so I am extremely happy to be a Teacher at Sea so I can begin to glimpse all the science our oceans entail. I was also inspired to apply after hearing the stories from two Teacher at Sea Alumni Jennifer Goldner and Kaci Heins, who I met at Advanced Space Camp and now call dear friends. 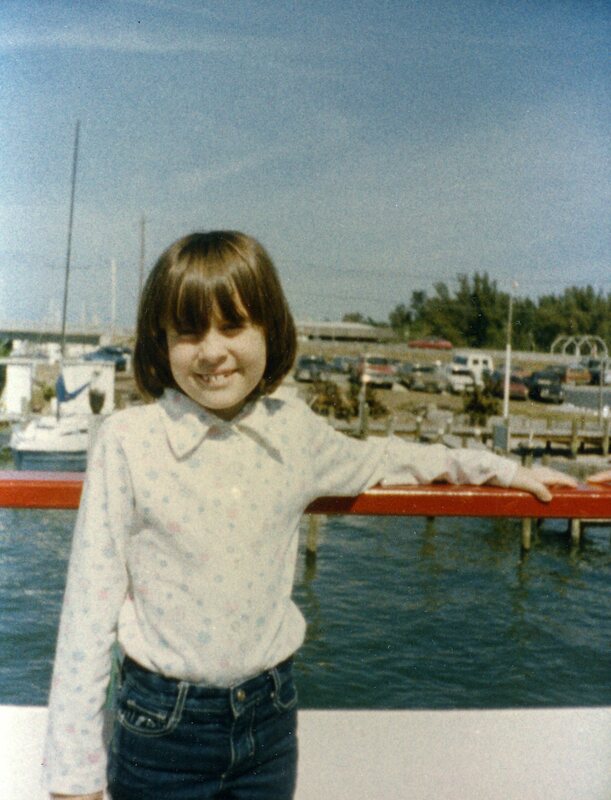 I grew up on the west coast of Florida near the Gulf of Mexico. Just two miles from my house was a tiny commercial fishing village, Cortez. My childhood best friend lived in Cortez, so I spent many days running up and down the docks and sampling the fresh caught seafood. (Fresh smoked mullet was my absolute favorite!) This gave me a unique look at the importance of fishing to a community. I even had a chance to go out on a small boat with a commercial fisherman and a few of my friends one night and catch fish via nets. So even though space has always been my passion, I feel a connection to the ocean as well. My cruise is on the Henry B. Bigelow, a NOAA ship outfitted for fisheries research. You can take a virtual tour of the Henry B. Bigelow including the science labs, and track the ship here. I am part of Leg II of the Autumn Bottom Trawl. We will be taking samples of fish and other species of marine animals from the Mid-Atlantic to Southern New England to measure the abundance, health, and age of certain fish species. As part of the science team, I will work a twelve hour shift everyday – either from noon to midnight (day shift) or from midnight to noon (nigh shift). I will find out my assigned shift when I arrive to the ship. Right now I am working on getting everything I need ready and thinking about packing. Since space on the ship is very valuable, I am trying to pack as lightly as possible. Some of the things I plan to bring with me are earplugs (I hear the engines are loud so it’s good to have these while sleeping), anti-nausea aids so I don’t get seasick, and cameras to document my trip. 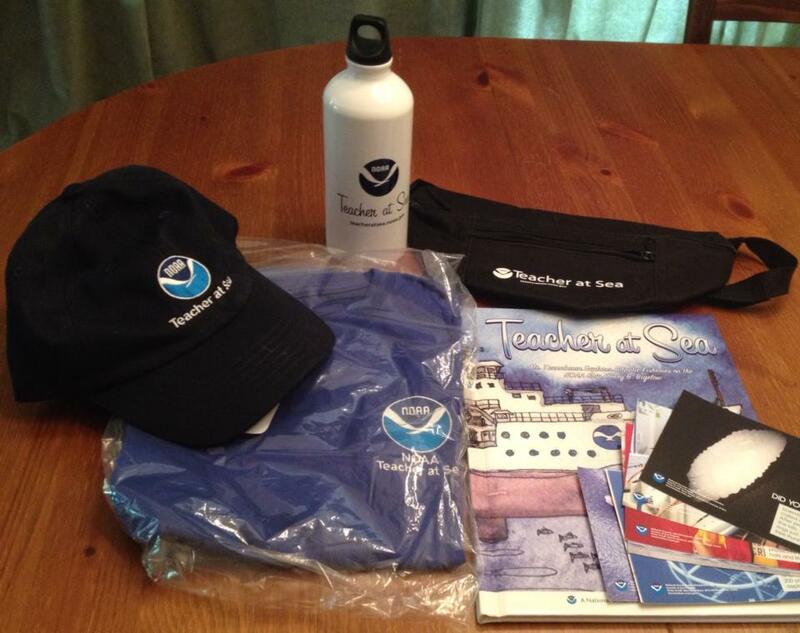 A couple of weeks ago, I received this cool package of items from the Teacher at Sea program. I’ll definitely be bringing the water bottle, shirt, and hat with me. The good thing is there are laundry facilities on board, so I don’t have to pack too many outfits. I also plan to bring a companion along with me. 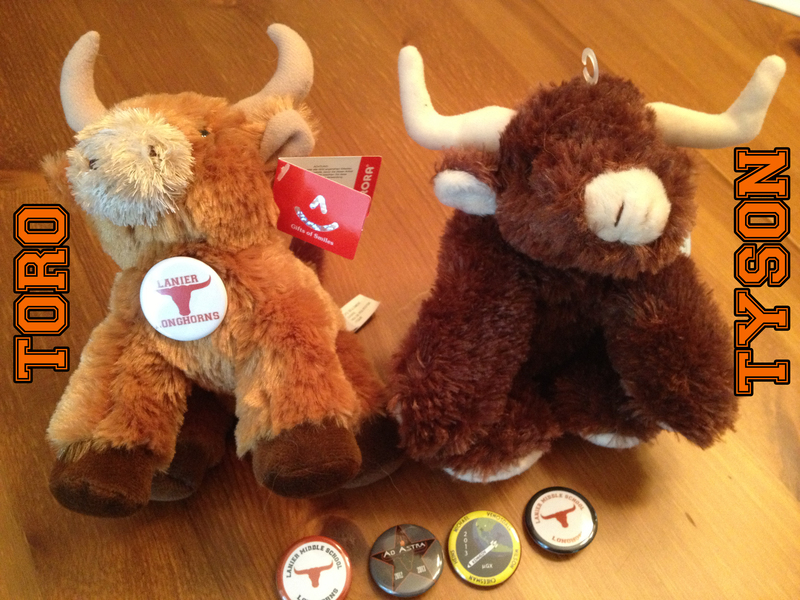 At my school, we are the Lanier Longhorns, so I will be bringing one of the plush longhorns along with me for this adventure. My question for you is which one? Toro or Tyson? You get to decide! Who should join me at sea: Toro or Tyson? At Lanier, our motto is Learn.Lead.Succeed. I cannot wait to learn new things on this trip and share them all with you! What things to you hope I will learn and share with you? Please leave your ideas in the comments. Until next time! This entry was posted in 2014, Janelle Harrier-Wilson, NOAA Fisheries Service, NOAA Teacher at Sea and tagged Autumn Bottom Trawl, chemistry, fisheries, Lanier High School, ocean acidification, Space Camp. Bookmark the permalink. @Anthony, sorry but you can’t come this time. However, I’m hoping to bring back info on cool NOAA careers! What will you be doing on the NOAA ship? I hope the trip goes well and you learn a lot to blog and teach us about. What in your childhood motivated you to go into science and get into NASA? Nick- Great post! This thing looks fun!!! ::–))) P.S. if tyson wins, can i keep him? Dillon- Will they have pie there M8. Justin- Hello, have fun at New England. @Nick-Thanks! I am excited. And sorry, but you can’t keep Tyson. He lives on my desk, so you can visit him! @Dillon-I don’t know. I’ll keep you posted. @Justin-Thanks – although most of the time I will be off the coast of New England. Congratulations on your success so far! I hope this goes well for you. It looks like fun and we will miss you. I prefer Toro though. I hope that you will come back with a better understanding of the ocean and its inhabitants that you can share with all of us. Thanks @Ryan. I can’t wait to share what I learn with all of you. Maybe I’ll bring back some new engineering design challenges, too! @Michael I hope well. Although I have to be flexible because things can change quickly at sea. I could use a cruise right now! You are lucky you get to be part of such a cool scientific excursion. Don’t let the fishies bit you! Thanks @Tucker! I’ll look out for the biting fish. I think it is really cool that out of all the people you were chosen for this opportunity. It is going to be a lot of hard work though. I mean twelve hours day or night! P.S. Don’t forget to bring some power snacks to get you through the day. @Kent – True 12 hour days will be long, but it will be a new kind of challenge. As far as snacks, I hear the food on board is amazing. I can’t wait to find out for myself! Have you ever considered working at sea over being a teacher? @Danny, I have never thought of working at sea over being a teacher. However, I am super excited for this opportunity to get a small idea of what life at sea is like. A floating science lab is a pretty cool thing! I think its really cool you were chose. Oceans cover most of the earth, but there is still a lot we don’t know about them. I don’t like boats though, so my chances of exploring the ocean are quite low. how was it when you felt no gravity ? cool like space the sea is unexplored. What inspired you to take this cruise? @Garrett, I wanted to learn more about our oceans. I feel like a space expert but not an expert on the oceans. I want to learn! How do you measure the pH of the ocean? It’s a big Ocean! @Nilson Good question. The ocean is big! It’s the pH of the local area sample that is used. Lots of measurements from different areas can be used to find the average pH of the ocean. Maps can be made of different areas, too. Take some good footage so we can see how fun it is, because I would like to do something like this. Also, i picked Toro! @Nathan Thank you! Mr. Reilly said I could take CDAT’s Go Pro camera, so I should get some cool video, and I’ll have my camera, too. I think that this trip sounds really interesting. I can’t wait to hear all about all the things you find out! @NickT Hmm – that sounds ominous. Remember, you can vote multiple times using different devices! Tyson has to go with you. @Krishan Thanks for the vote for Tyson! @Leisiris I’ll find out my assigned jobs next week when I get on the ship and meet the crew and scientists. I think I’ll be helping with the sorting and counting of the fish species. Are there any specific experiments you are doing at sea?-G.Z. @Gina I am not sure yet what my specific job will be. I know that we will be sorting and counting fish species. How can you tell the age of a fish? @Henry From what I’ve learned so far, it’s by looking at the inner ear of the fish. It’s kind of like tree rings. I should have more details for you soon. @Jake That’s a great question! NOAA stands for the National Oceanic and Atmospheric Administration. @Ali I’m not entirely sure yet. I know I will get to help scientists with the fish sampling. I hope I’ll learn a lot more about the ocean and the abundance of fish species. @Keith What do you want to know about different types of fish? The types we will catch and sample? Look for updates next week with more details! how did it feel when you were being lifted from the gravity being gone? You’re very lucky to be going on this ship!!! @Bryan. Thank you! I’m excited that I will get to share this with all of you! How did the effects of no gravity feel?? @Taujha It was amazing. Have you ever had a dream that you could fly or jump without falling? It felt like that. What do you expect to encounter while on your voyage? @Matthew, lots and lots of fish! So far, we’ve seen lots of different kinds of flounder like summer flounder, yellowtail flounder, and four spot flounder. We’ve also measured a lot of scup. I’m already learning a lot about identifying different kinds of fish and gender/development of the fish. I don’t know what the coolest thing I will see will be yet! Mrs.wilson, are you having fun on your adventure? and was there a change of balance in your body as you settled onto the boat? @Taujha, So far, I haven’t had any trouble adjusting to being on the ship – or getting my sea legs as they say. We did two hauls yesterday which involved sorting through the fish and then taking their measurements. I have learned a lot already! @Emily, I didn’t either. It’s pretty cool to see all the different types. So far, I have seen winter flounder, summer flounder, windowpane flounder, yellowtail flounder, and gulfstream flounder. i think it’s so cool! you’re so lucky to get to go on this trip! Tyson should have been the longhorn to go! !